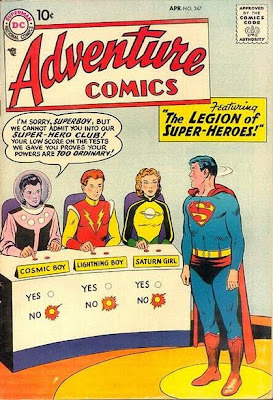 The DC Silver Age superheros appeared to have teenage sidekicks almost at random. Batman did certainly, Superman did sort of, but Green Lantern, Atom and Hawkman all eschewed the buddy combination, as did later DC heroes like the Spectre, Metamorpho and the Creeper. But Flash got Kid Flash, and since it became so significant an event in the DC Universe, it is worth looking back on. Kid Flash first appeared in Flash #110. Wally is Iris West's nephew and Barry feels an affinity for the young lad, who's clearly one of the Flash's biggest fans. But when the Flash appears himself (of course Barry slipping away), lightning does strike twice. I suspect what happened was a suggestion from the publisher for a Kid Flash character, because that is one of the lamest origins for a DC character ever. Oh, by a wild coincidence he got hit while by lightning standing in front of some beakers and test tubes, just as Barry did? That's lame and intentionally so. Like all of DC's young heroes, he starts out as a boy and quickly becomes a teen. In Flash #110 he looks to be about 8 years old; by the end of the 1960s he will be clearly a man. This is not really a hard thing to work out. First, of course, is Showcase #4, the comic that started the superhero revival that is probably the biggest aspect of the Silver Age. 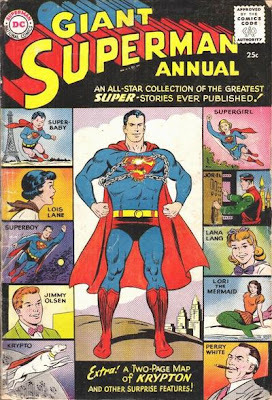 To give you an idea, during the 1950s, DC Comics published 3,397 different comics, of which 849 were superhero-oriented (including Lois Lane and Jimmy Olsen). In the 1960s, DC published 3,579 different comics, of which 1,629 were superhero-oriented. The return of the Flash kicked off that surge. The Legion was one of DC's best features during the Silver Age. The combination of a futuristic setting with super-powered characters proved irresistable to readers of the time and provided seemingly endless plot possibilities. The third major DC comic of the Silver Age is Brave & Bold #28. 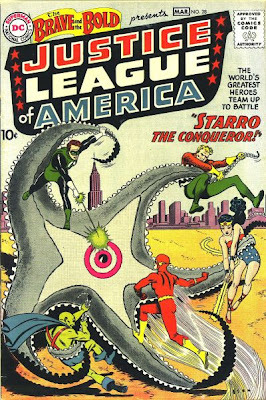 Now that DC had brought back Green Lantern, DC combined him with the Flash, Martian Manhunter, Wonder Woman and Aquaman into a fighting team called the Justice League of America. This served as a marketing gimmick for the individual magazines featuring those heroes (although at the time both Aquaman and Martian Manhunter were backup features in Adventure and Detective respectively), but it also apparently sold very well on its own, leading Marvel Comics' head honcho Martin Goodman to instruct Stan Lee to create a superhero team, which of course became the Fantastic Four. Prior to this, DC had reprinted almost none of their older stories. Superman Annual #1 gave recognition to the fact that comics had a back story that it was important to understand in order to get the most out of current issues. It also represented a promise from the editors to you, that if you didn't know the back story, DC would fill you in over the years with reprints of their older tales. DC did a phenomenal amount of reprinting in the 1960s and early 1970s. Even Marvel got into the act once their comparatively recent tales were old enough to attract new readers. 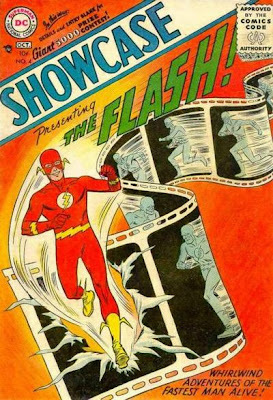 In the very first appearance of the Flash in Showcase #4, we learned that Barry Allen had read comics featuring the Jay Garrick Golden Age Flash. So it seemed only logical to pair the two up. But there was a problem; Jay Garrick (the gentleman on the right) had been a fictional character only on Barry Allen's Earth. The solution hit upon by Gardner Fox was to postulate an alternate Earth, called Earth-2, where the Golden Age superheroes had reigned. This opened the door for a slew of Golden Age/Silver Age crossovers, about which I have a post planned for the future. 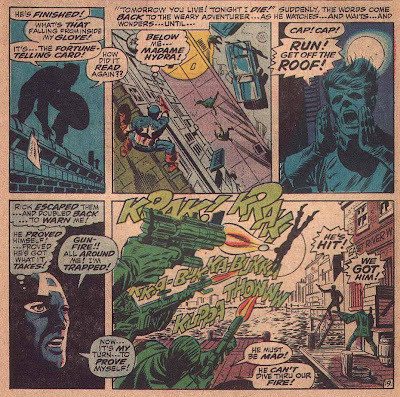 It also created numerous headaches for DC's editors as time wore on, but that was not apparent in the 1960s. Showcase #22, featuring the origin of the Hal Jordan Green Lantern. 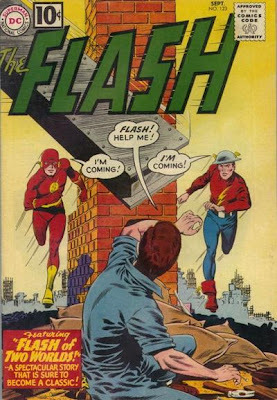 Lost in the memory of the Silver Age is the fact that it took three years after Flash's debut issue for DC to bring back its second GA hero in a new form. After this the pace quickened, with Aquaman, Atom and Hawkman all getting new launches. Detective #225, with the first appearance of the Martian Manhunter, which actually predates Showcase #4. However, MM was a new character, not a rebirth of an old one. Detective #327, with the "New-Look" Batman. Certainly the Batman TV series had a huge impact on DC Comics, but it is hard to say that this really spawned the show. Indeed, it is arguable that far more influential was Batman #155, which started the practice of bringing back Batman's Golden Age rivals (in this case, the Penguin). Action #242, with the introduction of Brainiac. This is arguably the beginning of the Silver Age Superman under Mort Weisinger, although his name would not appear as editor for another few months. Weisinger's tenure running the Superman books was extremely influential, as he standardized the looks and mannerisms of the characters and presided over a substantially more serious hero than had been the case in the past. Superman in the 1940s and 1950s, perhaps influenced by Captain Marvel, had a touch of whimsy to it. Under Weisinger most of that was gone (with the notable exception of the Lois Lane series). 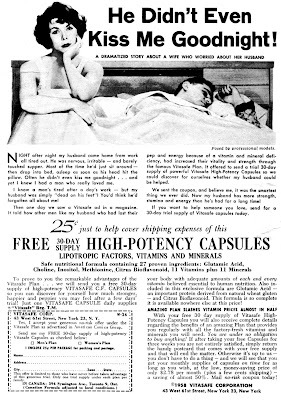 This marital aid brought to you by Forbidden Worlds #79 (American Comics Group). 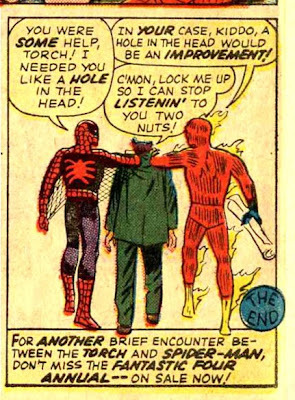 Here's an oddball early teamup of Spidey and the Human Torch. Marvel quite naturally wanted to establish some bond between their two teenage superheroes (at the time, this being before the debut of the X-Men). The Torch had been a major character in the Golden Age for Marvel (then known as Timely) and he was also 1/4 of the Fantastic Four. 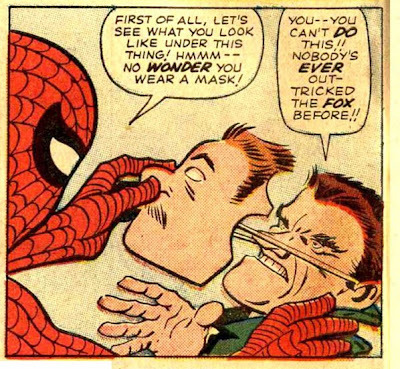 Spidey was a new character, whose comic was then less than a year old. Strange Tales was the magazine that featured the Torch in his solo adventures. So one would think that Johnny Storm would at least hold his own in the teamup story. But it did not develop that way. Of course, eventually he convinces the Torch that he is not responsible for the theft and they team up to fight the real criminal, the Fox. Although the Torch does save Spiderman in one memorable moment, for the most part it's Spidey following the clues, Spidey asking the questions, and the Torch mostly looking like an ornament. When it comes time to catch the villain, guess who does it? 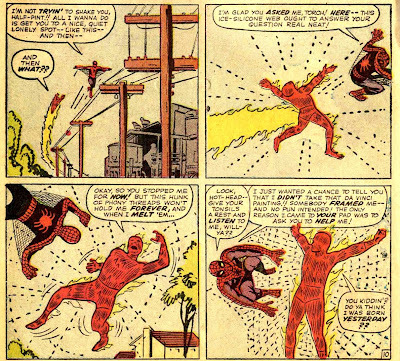 The Human Torch co-starred with Spiderman in several adventures including a memorable run in ASM 17-19. But you could see the passing of the baton to the new guy in this story, in what obviously turned out to be a preview of things to come. 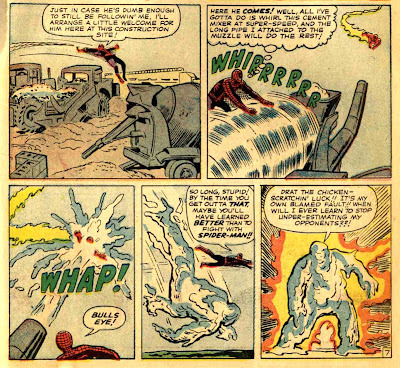 The Torch ended up not a strong enough character to cover his own mag in the Silver Age, and eventually was squeezed out of Strange Tales in favor of Nick Fury Agent of Shield. And Spidey... well I guess you know that story.